The $35.00 tire that adds more control and better lap times for WAY less money! 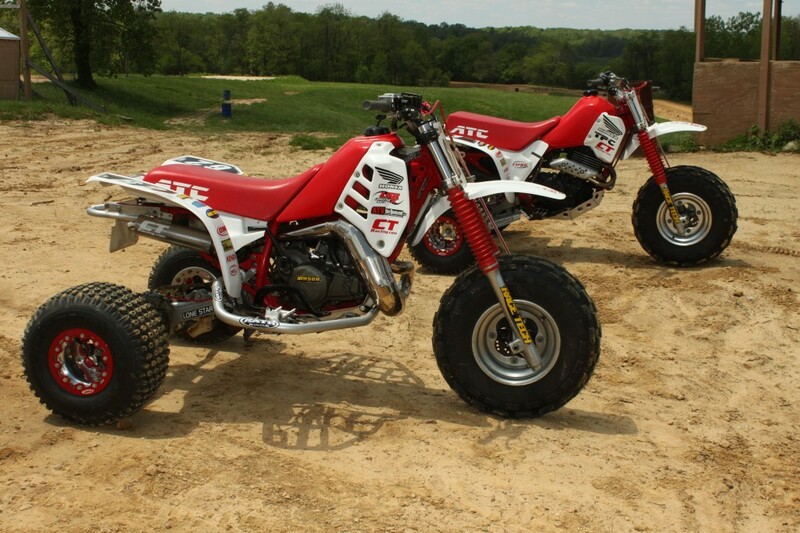 A couple years back we turned a 1985 Honda ATC350X and 1986 ATC250R into a pair of vintage ATV racing juggernauts. 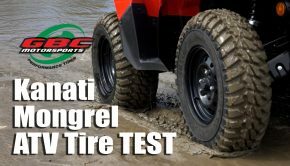 While our Kenda Scorpion tires were quite affordable and provided a great blend of traction and easy sliding on tilled, loose, or sandy tracks, we wanted a tire that would break loose more easily on hard-packed, dry, or tacky tracks, like those commonly found at indoor motocross or TT events. Turf Saver lawnmower tires are available from many brands. They’ve been winning three-wheeler races for decades including many modern day events. 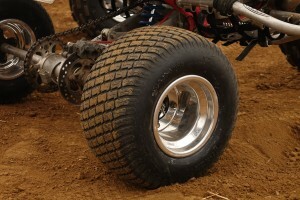 At Walmart.com we found 18×9.5-8 Hi-Run, Turf Saver tires selling for $39, about $100 less than some modern ATV racing tires. We ordered up a couple pairs and installed them on our highly-modified CT Racing Engine powered 350X and 250R to see how they perform. We wrapped the Hi-Runs around a set of .160 thick, spun aluminum wheels from Sedona Tire and Wheel, providing light weight, good strength, and appearance. 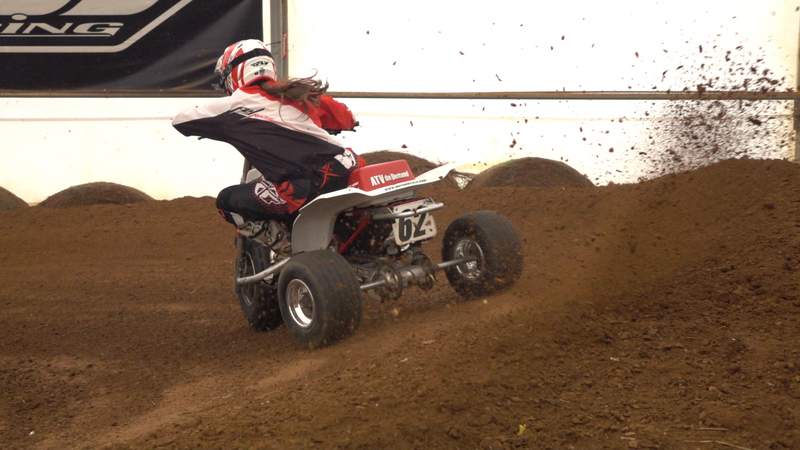 We took our trikes to Earlywine Indoor Motocross, the coolest indoor track on the planet allowing trikes to practice and race. Turf Saver lawnmower tires have been winning three-wheeler races for decades including many modern day events. We wrapped the Hi-Runs around a set of .160 thick, spun aluminum wheels from Sedona Tire and Wheel, providing light weight, good strength, and appearance. Unlike modern knobby motocross tires, or super sticky flat track tires, the Turf Saver tires feature a grooved tread surface designed to allow a lawnmower to make sharp turns without diffing in and tearing up your grass. While their lack of traction makes them stink as a lawn tractor tire any time you get near a tiny mud puddle and wind up stuck, their lack of traction has made them a very viable choice as a three–wheeler racing tire. We inflated our tires from between 10 and 13 pounds of air, preferring the ride quality of the lower pressure, and the easier sliding of the higher pressure. Off the half-packed-in starting line, the Hi-Runs provided a surprising amount of bite, carrying the front tire across the gate and down the start straight for 15 or 20 feet. We found this surprising as we expected the 250R to struggle for traction everywhere on the track. That wasn’t the case, though, on the extremely tacky dirt. In turns, the tires provided a good balance between drive and willingness to slide. You could hook up and power your way through corners, but that’s not the fast way to ride a three-wheeler. Add in a crank of the bars and a blip of the throttle, and the back end could easily be coaxed loose providing a predictable slide through corners. While we did manage to bicycle on a couple of occasions the tires never seemed to want to hook and highside you unexpectedly. If the inside wheel starts to pick up, blip the throttle and break it loose. In turns, the tires provided a good balance between drive and willingness to slide. 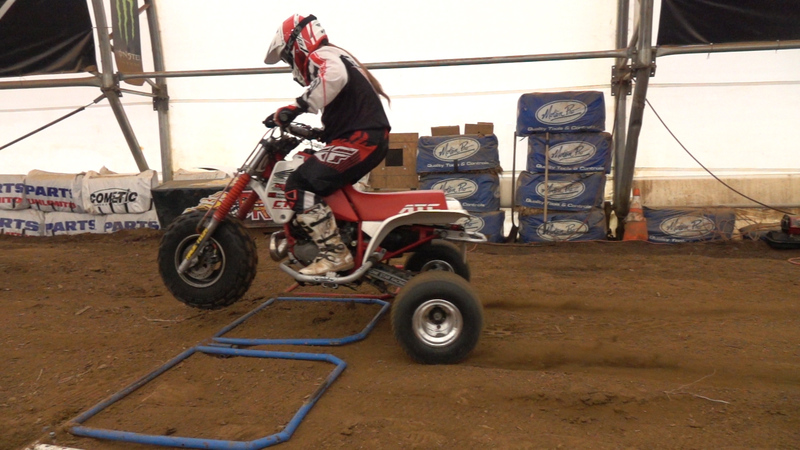 Exiting turns, the tires provided a smooth transition from sliding to providing a surprising amount of grip, making it easy to get up to speed for jumps. There was also plenty of bite available helping to carry the front end through whoops. Entering corners, we found the Hi-Runs to offer a good amount of braking traction, while still allowing you to initiate the turn. As the day wore on, the fast line became harder and drier. The less traction that became available, the better the tires seemed to work––initiating the turn more easily, sliding predictably, and powering out of the corner. For times when we got off the race line out in the deeper loam, the tires’ grooves provided enough bite allowing you to power out of the deeper stuff. 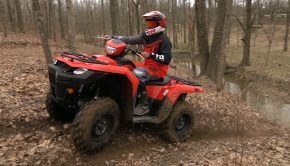 Their light weight and good sliding characteristics make them a good choice for smaller displacement machines like the 200X or Tri-Moto 175, as well as high horsepower missiles like our 250R and 350X. High-Run’s two-ply construction and lack of tall knobs keep the tires light. 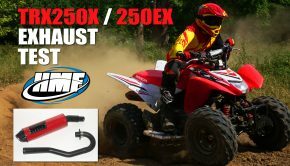 Their light weight and good sliding characteristics make them a good choice for smaller displacement machines like the 200X or Tri-Moto 175, as well as high horsepower missiles like our 250R and 350X. After a few motos, our tires are showing no signs of detectable wear. Avoiding any puncture of pinch flats, we could see getting an entire season out of one or two sets of tires. Sedona’s spun aluminum wheels feature a .160 wall thickness. Rolled inner and outer lips add strength for banging off berms or the competition. While we haven’t put enough time on the Sedona wheels to fully evaluate them, we landed crossed up on a couple of occasions, and hammered the wheels in the very unevenly worn whoops with no bends to report. 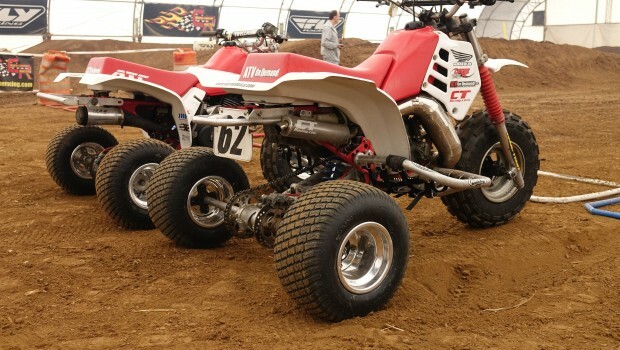 We found the Hi-Run Turf Saver tires to work well on both our two and four-stroke machines. If you can only afford one pair of race tires for your trike, this would be a good choice, although they would be poor performers in the mud. We would still like to have our Scorpions for tilled or sand tracks, but for the hard track conditions we commonly face, the HI-Runs work quite well. Hopefully Walmart won’t catch wind that we consider the Hi-Run Turn Saver tires a high-performance racing tire or we can expect the price to go up $100. For now, they’re $39.00 delivered to your local Walmart store with price and performance that’s hard to beat. Summary: We found the Hi-Run Turf Saver tires to work well on both our two and four-stroke machines. If you can only afford one pair of race tires for your trike, this would be a good choice, although they would be poor performers in the mud. We would still like to have our Scorpions for tilled or sand tracks, but for the hard track conditions we commonly face, the HI-Runs work quite well. Hopefully Walmart won’t catch wind that we consider the Hi-Run Turn Saver tires a high-performance racing tire or we can expect the price to go up $100. For now, they’re $39.00 delivered to your local Walmart store with price and performance that’s hard to beat.